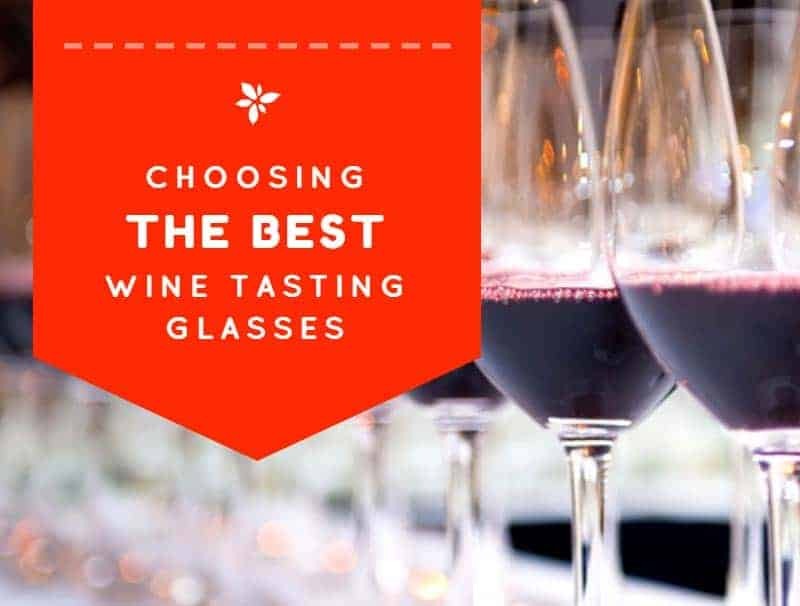 Sipping the wine from the best wine tasting glasses is essential if you want to enjoy the true flavors and aromas of the wine. At least according to the specialists. But is it true? Does the glass really influence the taste of the wine? In short, yes! If you’d like to know how, read on. Otherwise, check the best wine tasting glasses on the market by clicking the links in the table below. Wine tasting glasses have long been subject to debate. Many enthusiasts claim they are useless. Wine experts argue they are necessary. In the end, they exist for a reason. While they don’t actually change the taste of a wine, they alter our perception of the flavors and aromas. But with so many wine glasses available on the market, how to identify those manufactured specifically for tasting? Nothing simpler. Just use the ISO ones. When talking about wine, it’s easy to end up in arguing about the right stemware. Some enthusiasts claim each wine needs a different glass. Others say that the right type of glass is ideal for all wines. The truth? According to the International Standards Organization, there is only one type of wine tasting glasses. The standard defines the shape and size of the glass, alongside other characteristics. In detail, a tasting glass must have an elongated egg shape and the cup has to be supported by a stem resting on a base. The opening of the glass also has to be narrower than the body, to concentrate the bouquet. Apart from the shape and physical characteristics, the standard also defines the volume. The standard capacities are 12cl, 21.5cl, 31cl, and 41cl. This goes from 4oz to about 14oz. The 21.5cl (7.27oz) glass is considered the “one glass for all” by sommeliers, professional tasters and wine critics around the world. A bit like the “one ring to rule them all” from the famous movie. Jokes apart, this glass is perfect for reds, whites, fortified wines and some even claim that sparkling wine can be tasted from this glass. Like highlighted above, finding the right wine tasting glasses is simple. But between theory and practice, there is always a difference. Given the variety of stemware, many wineries, wine shops, and wine tasting rooms use different types of tasting glasses for different varieties of wine. Most wineries and tasting rooms use traditional red wine glasses when proposing red wine to their guests. This stemware is characterized by a large cup, thin rims, and a wider opening than the standard glass. This promotes a quicker aeration of the wine, enhancing the aromas and improving the perception of the flavor. Stemware used for white wines is characterized by a more elongated cup and a narrow rim. This concentrates the fresh aromas of the beverage at the top of the glass, highlighting its crisp or sweet flavor. Moreover, a narrower rim also minimizes the acidity of the wine. As for the size, these glasses are usually medium-sized. Like it is easy to imagine, sparkling wines are usually served in flutes. The elongated shape is perfect for holding the fizz of a sparkling wine and they have been specially created to retain the bubbles. This allows you to feel the characteristic bubbly texture in your mouth. Due to the higher concentration of alcohol, fortified wines are usually served, and tasted, in small glasses that tend to emphasize the fruity aromas of the drink. Although smaller in size, the glass should still be provided with a stem and large enough to allow swirling. You can choose the right wine tasting glass based on your favorite wine. If you love reds and are rarely interested in whites, a traditional red wine glass should be perfect. The same goes for all the other types of wines. If you’re learning about wine and want to taste as many varieties as possible, choose a standard wine tasting glass as described by the ISO standard. Here, the choice is simple. Choose glass or crystal. There are many plastic or polymer stemware available on the market and advertised as wine tasting glasses. While these might be fine to drink some wine at an open-air festival, they are not appropriate wine tasting glasses. As we already mentioned, the material doesn’t change the taste of the wine but it alters your perception of it. To fully enjoy the bouquet and flavor, glass or crystal stemware is a must. Another subject of debate. But when in doubt, check the ISO standard. If they require a stem, there must be a reason for it. And the reason is simple. The stem is there to allow you to hold the glass without warming up the liquid inside. It’s not just a fancy design. In a stemless glass, your body heat will warm up the beverage, altering its characteristics. For a proper tasting, choose proper stemware. Libbey Wine Party 12-piece Stemware Glass Set is advertised as a set of elegant yet casual stemware set, which it is. But the shape, size, and design make these glasses perfect for wine tasting. The stemware is shaped to accentuate the aromas and flavors of both reds and whites, and they are also ideal for fortified wines. The set contains 12 identical glasses. Each of them has a capacity of 12.75oz, which is slightly smaller than the 41cl standard wine tasting glass. This capacity is perfect for tasting, as the large cup will enhance the flavors and aromas, but also makes the glasses versatile. In fact, these glasses are also perfect for every-day use. They will rock your wine party and are ideal to use for lunch or dinner. Manufactured in the USA from lead-free materials, they are safe to use by both adults and teens for alcoholic and alcohol-free beverages. For a hassle-free cleaning, the glasses are also dishwasher safe. This guarantees a quick and easy cleanup, making them ideal for all uses and occasions. Capacity: with a capacity of 12.75 ounces, these wine glasses are perfect for tasting events but also for enjoying wine in the comfort of your home. Material: the stemware set is made of high-quality lead-free glass and is manufactured in the USA. They comply with all federal regulations. Universal: the shape of the glasses accentuates the bouquet and flavors of both red and white wines. They are also a great option for tasting fortified wines. Dishwasher safe: perfect for multiple uses, these glasses are also easy to clean. They are dishwasher safe or you can simply rinse them with warm water. The glass is rather thin and the stemware might crack easily. Schott Zwiesel is a German manufacturer of innovative crystal glass stemware. Established as a state-of-the-art manufacturer, the brand proposes a wide variety of wine glass collections designed to enhance and highlight the qualities of specific varieties of wine. The Pure Collection includes five stemware sets. Each of them includes 6 wine tasting glasses of various capacities and sizes. For example, the Sauvignon Blanc glasses have a capacity of 13.8 ounces, are 9.1 inches tall and 3.3 inches wide. These sizes have been studied specifically for this wine, making the stemware perfect for specific wine tasting. Regardless of the collection, all Pure glasses impress with their angled bowl and long, sleek stem. These characteristics make the glasses a true design element and they match wonderfully a contemporary interior or a stylish wine tasting room. The glasses are made of Tritan crystal, a patented material composed of titanium oxide and zirconium oxide. These two materials add strength to the glass, making it chip, scratch, and break resistant. Without a doubt, these wine tasting glasses are among the most stylish and elegant on the market. Quality: manufactured in Germany, these glasses are lead-free and made of Tritan crystal, a scratch, chip, and break resistant material. Specific: the manufacturer designed different collections for different wine varietals. You can choose the perfect glass for Pinot Gris, Sauvignon Blanc, Bordeaux, Burgundy, Champagne, Cabernet, and more. Dishwasher safe: these glasses are easy to clean. They are dishwasher safe or can simply be rinsed with warm water. Brilliance: made of tempered crystal, these glasses are not only strong but also brilliant. They will certainly enhance your wine tasting experience. These glasses are simply expensive. Remember the “one glass for all” mentioned above? Well, Ravenscroft Crystal Essentials International Tasting Glass is one of those. Designed specifically for a wine tasting of different varieties, the glasses in this set are ideal for tasting events or for home parties. The capacity is the standard one, namely 7.75 ounces. As for the size, it is also standard. The glass is 6.25 inches tall and has the right size to enhance the aromas of fresh whites and aged reds alike. Moreover, the glass is perfect for serving or tasting fortified wines. The glasses have an impeccable quality and are made of lead-free crystal. They are strong, scratch-resistant and designed to last for a long time. As for the cleaning, the glasses are dishwasher safe and also easy to clean by hand. Another important feature of this set is the convenience. The stemware comes in a set of 12 glasses and at a more than affordable price. Therefore, if you’re looking for a universal wine glass and the best price/quality ratio, the Ravenscroft set might be the best choice. Design: the Ravenscroft glasses comply with the ISO standards. Many wine experts consider them the perfect wine tasting glasses. Elegant: the classic design of these glasses is elegant and stylish. They are made of lead-free crystal and have an attractive brilliance. Versatility: the 7.75oz capacity makes this glasses perfect for wine tasting or for home use. They are ideal for Port and other fortified wines. Strong: the lead-free crystal is a strong and resistant material. The glasses won’t get scratched easily and are chip and break resistant. While they are certainly ideal for wine tasting, they are rather small for home use. 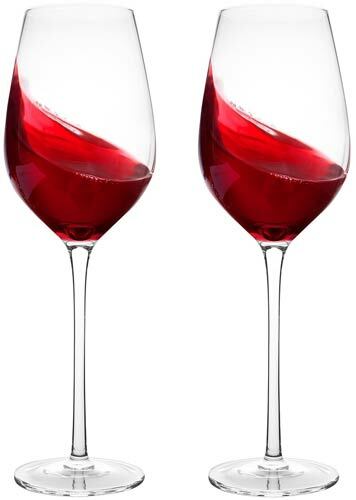 The Bella Vino Hand Blown Long Stem Red Wine Glasses are not made specifically for wine tasting but they are perfect for the purpose. These traditional red wine glasses are ideal for serving or tasting all varieties of red, and the manufacturer also proposes a set perfect for white wine. The glasses are elegant yet sturdy. They are durable, brilliant and made of lead-free materials. But strong doesn’t mean thick. The thickness of the glass is just right to enhance the aromas and flavors of your reds. Another thing we like is the manufacturing process. The glasses are hand-blown, which makes every glass unique. The technique gives a special elegance and style to the stemware, creating a smooth surface that highlights the qualities of the wine. The glasses are strong and resistant, and the manufacturer stands for the quality of its products by offering a glass replacement guarantee. Moreover, the manufacturer also offers a money-back guarantee should you not be happy with the quality of the stemware. Material: these wine tasting glasses are made of premium quality crystal glass, boast a clear and smooth surface and are made to enhance the flavors and aromas of red wines. Hand-blown: the stemware is made by experienced craftsmen and is hand-blown. This process guarantees the quality of each glass. Elegant: the glasses have an elegant design yet they are sturdy. Moreover, they are thin enough to highlight the qualities of the wine. Every-day use: since these glasses are not made specifically for wine tasting, they are perfect for everyday use. A white wine stemware set is also available. The glasses are not dishwasher safe. D&V Valore European Crystal Glass is another set of wine tasting glasses to consider if you’re looking for multipurpose stemware. According to the manufacturer, these glasses are created for white wine or tasting, therefore they are a safe choice for either purpose. However, if you’re considering them for tasting, you should know that they are slightly bigger than standard wine tasting glasses. In detail, they have a capacity of 10.7 ounces, are 7.2 inches tall and 2.9 inches wide. The bowl shape is classic while the thick stem ensures stability. This makes the glass sturdy, durable and dishwasher safe. Regarding the material, these glasses are made of lead-free and break-resistant crystal glass. They are made in Germany and are ideal for commercial purposes or personal use. Design: these wine tasting glasses boast a simple and elegant design. They are manufactured as standard white wine glasses but are suitable for multiple purposes. Break-resistant: the lead-free crystal glass is scratch, chip, and break-resistant. The glasses are even dishwasher safe. Capacity: the 10.7 ounces make these glasses ideal for a wide range of purposes, from commercial to personal use. Choice: the manufacturer proposes a wide range of wine glass sets including all-purpose glasses, champagne flutes, and red wine glasses. Some users believe these glasses are rather delicate. In terms of favorite design, our choice would have been different. But given that we’re evaluating the best wine tasting glasses, our choice couldn’t have been another. In our opinion, the best wine tasting glasses on the market are the Ravenscroft Crystal Essentials International Tasting Glasses. As their name suggests, these glasses are manufactured specifically for this purpose. They have the standard capacity recommended by ISO and are made of brilliant lead-free crystal. They are ideal for all tasting purposes and suitable to be used as fortified wine glasses in a private environment. They also come in a set of 12, and given the quality of the glass, the price/quality ratio is fantastic. Without a doubt, this is a set of outstanding wine tasting glasses to consider for commercial or personal use.